Once a nursery for budding talents, the City Chess complex in Elista now attracts little interest from locals or foreigners. Imagine a Mongolian Buddhist nation on the fringe of Europe – temples, lamas, even a few yurts. If that seems like some medieval map-maker’s fantasy way of filling in the empty space – like drawing monsters in some uninhabited ocean – then you’d be wrong. This fascinating place exists in southern Russia, it’s called Kalmykia, and 15 years ago, financial trickery and megalomaniac ambitions briefly made it the chess capital of the world. Now all that remains of that dream is a gradually decaying building decorated with photos of Steven Seagal and Chuck Norris. Kalmykia dates back to the 17th century, when a Mongol tribe known as the Oirats decided to migrate west to avoid a brewing civil war, according to oral tradition. They pitched up in southern Russia and formed an alliance with the Tsar to keep the Caucasus hill tribes under control. Over the next three centuries, Kalmyks became fiercely effective cavalry and footsoldiers for Russia, fighting enemies as diverse as Napoleonic France and Hitler’s Germany. That loyalty meant nothing, however, in 1943 when Stalin deported nearly the entire population to Siberia. Almost 100,000 Kalmyks died. Given that chaotic history, it might be expected that Kalmykia’s post-Soviet history would be anything but boring, and so it proved. Chess-mad millionaire Kirsan Ilyumzhinov took charge of the region, which charged miniscule levels of tax on company profits, creating a handy tax haven a train ride away from the chaos of 1990s Moscow. “All the mafia money went there, giving the government a lot to play with,” a Kalmyk friend told me. 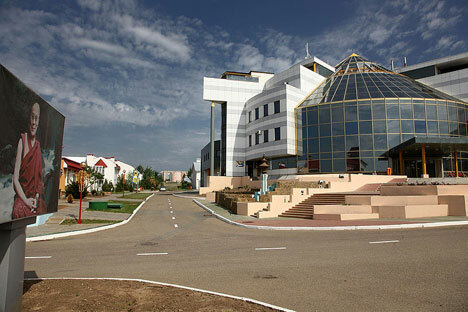 With cash flowing in, Ilyumzhinov became president of the then-troubled International Chess Federation (FIDE) and brought the world championship to Kalmykia’s capital Elista in 1996 – one of the few prestige projects for Russia at the time and one that carried real cachet. In Russia, not only does chess indisputably count as a sport, it’s a way of life for many. That sparked a rush to transform Elista, as Ilyumzhinov threw money at building a vast Chess City on the edge of the barren steppe. And that’s where the dream went sour. The central Chess Palace, a glass-fronted exhibition hall-slash-museum, is looking a little the worse for wear these days, but still in pride of places in the lobby is the original model for the City. It shows a vast development packed with flights of fancy that were never built, chief among them a fortress-like structure with turrets shaped like the castles from a chess set. Instead, the Palace is surrounded by a few streets of increasingly shabby chalets. Anywhere else, it would look like a rather original but rundown suburb. There were two crucial blows to the Chess City dream. Regular reports of human rights abuses tarnished the project’s image abroad, and in 2001, the Russian Duma put an end to the financial ingenuity that had fueled Kalmykia’s rise. Ilyumzhinov stayed on at the helm of FIDE – indeed, he’s there to this day, a much-diminished figure – but Chess City never managed to become the sport’s undisputed capital. A second world championship match in 2006 was the last hurrah, and since then, Moscow has claimed every major event to be held in Russia, reasserting a pattern from throughout the country’s history. Every so often, a region shoots for glory, and every time Russia’s relentless centralizing urge brings the power back to Moscow or St. Petersburg. Now Chess City is a wedding venue for middle-class Kalmyks, and Ilyumzhinov has been merely a chess administrator since 2010, when he resigned his regional presidency following his bizarre claims to have been abducted by aliens. In characteristically eccentric style, he popped back up on the world stage in 2011 for an exhibition game against beleaguered then-Libyan dictator Muammar Gaddafi, who was generously handed a draw, but only after a few prompts on how to move the pieces. Visiting the Chess Palace today is a surreal experience. Walking through the door with a friend last week, it took a while to persuade the bored and somewhat confused security guard to let us in - he simply refused to believe anyone would want to look around. Upstairs in the Palace is a photo gallery of all Chess City’s illustrious visitors, where it’s possible to chart the project’s demise. Alongside action film stars Seagal and Norris, there are long-retired soccer coaches and pop singers, a perfect chart of Russian celebrity from an age when people feared the Millennium Bug.